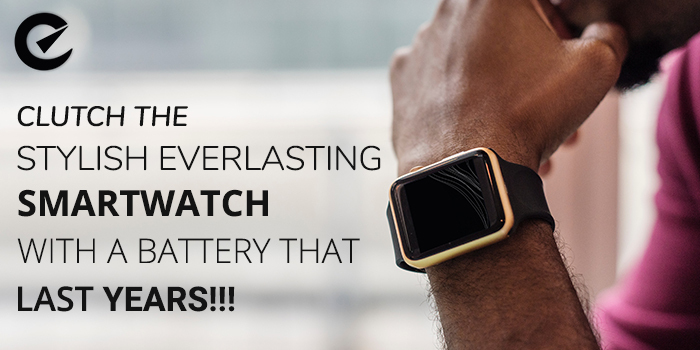 Clutch the stylish everlasting smartwatch with a battery that last years!!! Are you planning to gift yourself a new smartwatch? But hesitant to buy it, fearing about the damage that might occur after buying it at such hefty price. Relax your nerves and feel free to buy the new military watch which has included all the features you are looking for. Smartwatches are gaining so much popularity these days. Leveraging the power of the internet it does most of the work you perform, using your mobile phones. Whether you go for online shopping or book your tickets or call your friends, amazing features of smartwatch can help you with everything. The biggest problem with smartwatch is that it can be used by keeping it inside a shield like we do in case of mobile phones. Since, we wear it on wrist chances of getting damaged are higher and even higher is the price you have to pay for mending the watch. One should be really thankful for the latest innovation in the world of smartwatch, T1 Tact Watch, a new kind of watch made using robust military technology to make it durable and stylish as well. Are you curious to know about it? But what really makes T1 Tact a military grade watch? A small group of former military engineers wanted a stylish, durable watch that they could wear even in times of war. Very recently they used military technologies to introduce this new kind of smartwatch which is stunning, easy to use and super tough. Coming out of the boring looks of mini -computer like smartwatches, the design of T1 Tact watch is sleek and stylish with cutting edge Diamond like carbon (DLC) protecting the watch from getting damaged, along with 26 mm sports straps, 316 L stainless steel at the back and corning Gorilla glass 4 screen, making it the toughest military grade watch that too at much affordable cost. Worried about synchronizing it with your smart phone? Of course, you can and once you start using it you will never look back at any other expensive smartwatches. The battery longevity of this watch is also great. So, if you are planning to buy a smartwatch you can take the smartest decision of buying this one and use it in your everyday life. Previous PostPrevious Newest Smartphone trends sure to grab your attention in 2019. Next PostNext Success of any retail business lies in the hand of digital marketing.